Water and storage on boat. Join a small group of certified divers for our morning excursion to two extraordinary sites, one deepwater dive to a shipwreck and a shallow dive to a natural reef. Wherever you go, our crew will make sure you get the most out of your underwater adventure. Our divers have been lucky enough to see an endangered Hawaiian monk seal, a humpback whale and some phenomenal coral formations. We’ll show you the best of Oahu’s underwater wildlife. Tours depart from Kewalo Basin Harbor or Maunalua Bay, depending on your boat. We offer a complimentary roundtrip shuttle ride from your hotel. 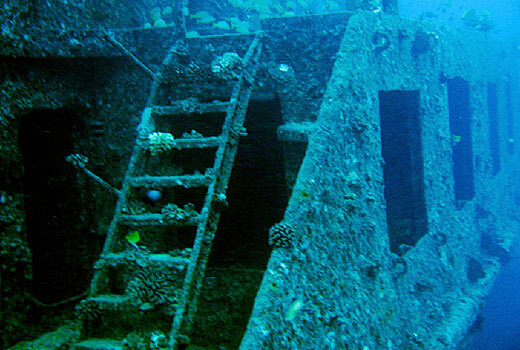 • The Sea Tiger: This is the deepest recreational shipwreck in Oahu’s waters. Ask your guide about the boat’s intriguing history involving 93 Chinese immigrants. • San Pedro: A Korean fishing company operated this boat back in the 1970s when it caught fire off South Point. • YO-257: Rich with history, this boat had its glory days during World War II and the Korean War. • Kewalo Pipe/Horseshoe Reef: Beware of the large schools of barracuda and the largest morays around Oahu. They call this place home. 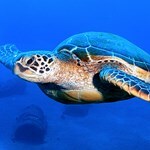 Turtle Canyon’s is the turtle spot off Waikiki where we often see 10 to 20 turtles on one dive. Max depth is 35 feet. This is a series of reef fingers with an incredible amount of life. This is fun for everyone even snorkelers. On a clear day even the most experienced divers will come up amazed. 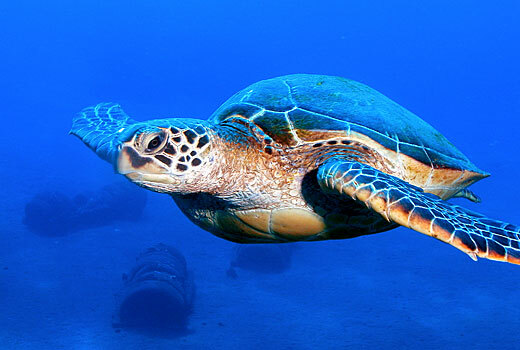 Turtle canyons is a very large site where two dives will still not see the entire site. 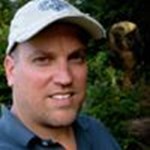 This is a calm site perfect for beginners. Koko Crater is a great place for certified divers and beginners! It has a depth limit of forty feet. Koko Craters is a series of underwater craters formed when Koko Head erupted. This is a cleaning Station for the Hawaii Green Sea Turtle. Some say it’s the turtle capital of the world. Koko Craters is Capt Chris’s Favorite shallow dive sight because he has seen everything come by one time or another from humpback whales to Monk Seals. He says there’s nothing like showing a first time diver a whale, dolphin or a monk seal. 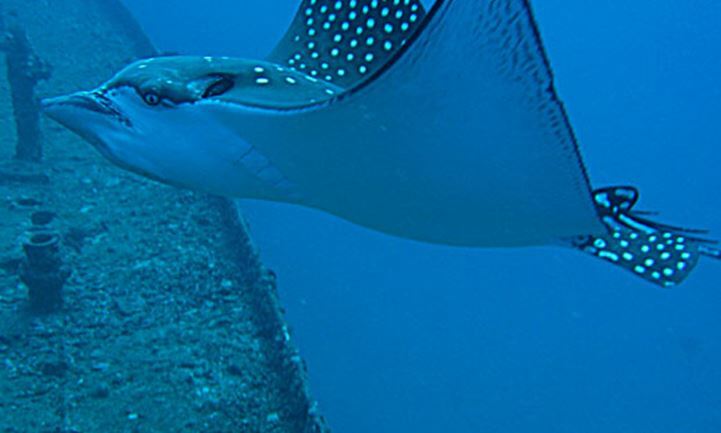 Excellent beginner to novice scuba diving site, 30′-40′ sand bottom with several craters. Several resident green sea turtles rest here. Schools of soldierfish and friendly, large puffers. 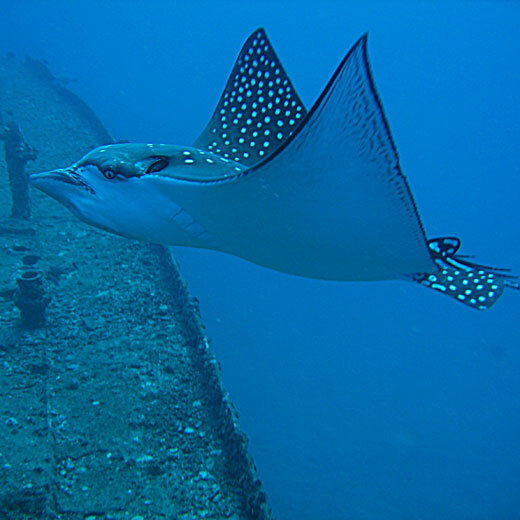 Anglers Reef is the home of Octopus heaven and spotted eagle rays. This dive site has a max depth of Forty feet. Anglers is a strait ledge that runs as far as a tank lasts. Frogfish are often found here but our favorite here is the plentiful amount of large octo’s. Hawaii loa Ridge is a gem when clear. This dive site sites in an area that is often has low viz so when it is crystal clears it is amazing. This is also a series of large craters. The craters are a bit larger than koko’s. Tons of fish the occasional great white tip!!! This is a very cool dive and can be visited by novice or experienced divers. Novice to intermediate, 35′-50′. There are lots of hard corals along a wall. Moray eels, goatfish and octopus can all be found here. Intermediate to advanced 45′-55′ wall dive with corals and several different types of butterfly fish. This is our Hawaii Gem when it comes to wrecks. Max depth is 107 feet. On a training exercise from Pearl Harbor in 1948, the pilot noticed the needle in the planes fuel gauge was falling. He continued the flight, thinking the gauge was defective, which they usually where back then. Soon after, however the engine began sputtering and down he went. He executed a perfect water landing. The pilot survived and the plane is in perfect condition. When you’re down there take a look at the planes propeller and you can see how it was bent during the impact. This is hands down Capt. Chris’s favorite wreck! He says he has seen everything they’re from monk Seals, large sharks and humpback whales scratching themselves on the mooring ball. Capt Eric was there for this experience as well. This is one of Capt Adams favorite spots. Max depth is forty feet. Pawaa is one large crater with a ledge that heads towards Koko Craters. They are similar sites in many ways. We have a dense amount of fish and turtles in a small area. This is great for beginners because we do not have to travel far to see. FantaSea Reef is Capt. Chris’s and Capt Dan’s favorite dive on the island they have been spear fishing there together since they where 18. Here you will be diving at a max of about 60 feet. 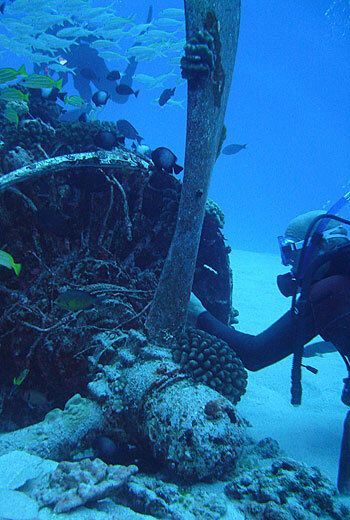 You will find the best coral formations with the largest fish on Oahu. We are talking pristine conditions below the surface. There is a reason why this sites is so nice. This spot is foe experienced divers conditions are often choppy with currents. The Submariner only makes it here when the stars align and the wind is down. 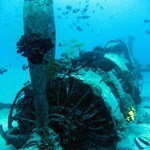 This wreck is a sunken barge sank for the purposes of fish and coral growth. Max depth is 85 feet. What makes the barge so nice is it lies on a shelf, which is very abundant in marine life. White tip sharks call the mini barge home and during whale season all you can hear is whales whales whales singing their hearts out. 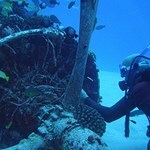 This is Capt Nick’s Favorite wreck!!! 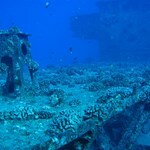 The LST was sunk for the purposes of fish and coral growth as well. Max depth is 90 feet. This barge is often called the upside down barge, due to it being upside down of course. Under the wreck is a large open area where you can often see sharks hanging out and makes for some beautiful lighting. The Sea Tiger is located about a quarter mile south of Kewalo Basin. Max depth is 130 feet but usually limited to 100 feet. In 1992 ninety three Illegal Chinese immigrants were discovered aboard this 168-foot ship, which was known as Yun Fong Seong No. 303. Its 5-crew member’s where sent to prison and the boat was seized. In 1994 it was sold to a Vietnamese fisherman who renamed it the Sea Tiger. After the coast guard repeatedly fined the fisherman he shortly abandoned it in Honolulu Harbor. Voyager Submarines bought the Sea Tiger for $1 and sank it in 1999. 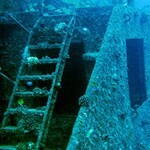 It is our deepest recreational wreck on Oahu. 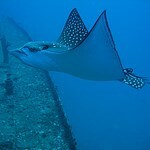 However it is very close to shore and is usually in very calm water making this a great dive year around. This wreck has a depth of 65 to 115 feet. This is a crew favorite. Everyone loves diving the YO. Commissioned in 1944 it was a fueling ship for other Navy vessels at sea during World War II as well as the Korean War. Measuring 174 feet long, it carried 250,000 gallons of fuel. As well as fuel this ship carries a large gun on the stern and the mount is clearly visible on the stern. At some point in the 1950’s the ship was decommissioned and mothballed in Guam. In 1989 Atlantis Submarines sank the ship as a marine life habitat. Than you Atlantis you made an incredible wreck!!! Not only is the YO a great wreck but when conditions are right and the air is plentiful you can swim about 40 yards over to San Pedro which lies beside her. When you do this it is a great time you will remember forever, diving two fantastic wrecks on the same dive!!! Max depth is 85 feet The San Pedro lies beside the YO. This wreck is 111 feet long. She was built in Japan and operated by a Korea fishing company. In 1975 the ship was carrying bait, food, and other cargo to a fishing fleet when she caught fire off South Point. Although it was badly damaged the ship was towed to Keehi Lagoon, where it remained anchored for nearly two decades before sinking in the harbor. Atlantis submarines again saved the day and sank the vessel for us to enjoy in 1996. This dive site is where we have our best chances of seeing white tip reef sharks. If we are running behind schedule the Atlantis submarine will give us a buzz while we are under. Max depth is 40 Feet. This a large reef dive located right outside Kewalo basin. This is a perfect second dive after the Sea Tiger or afternoon dive with our beginners or students. Octopuses are often found her as well as large eels. This is one of the only places where you see a larger school of Mu. Kewalo pipe is a very large site. Depending where we tie up depths very from 30 to 60 feet. This site is centered on an old storm drain which travels from shore to a huge coral bed in 60 feet of water. At the end of the pipe large schools of barracuda often hang out as well as the largest morays around. On the east side you will find horseshoe reef, which is abundant with life, and on the west side you will find Bob’s bunker. This by far is Marco’s favorite shallow dive he will make your head spin when you dive this site with him, one thing after the other. Yes you will need to be certified. In addition you should be an experienced diver and done many dives recently, as this packages goes really deep. If you haven't gone diving in a while, consider doing our afternoon charter. How long does it take to get to the dive sites by boat? Luckily they are not that far from Waikiki so it is just around 15 minutes at most to the sites. Let me know if you have any other questions! Mahalo! All scuba divers must be able to carry at least 30 lbs. I dive only once a year. These guys were professional, practiced safe dive methods, took into consideration my needs. 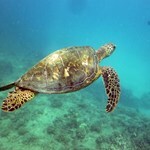 They went slow through the dive and pointed out the wonderful sea life below. The Canadian and Tim were awesome. 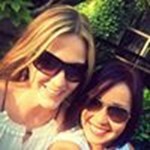 Ask for them on your next dive. I will be back and use this dive shop again. Very professional organization! Skilled instructors who really take the time to help you get the most out your dive experience! This was an epic family adventure that we will treasure our whole lives. Thank you Dave, Humi, CPT Steve and Lisa for an incredible time!